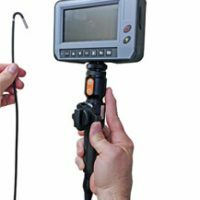 The portable video borescope provides high-resolution video images that are rich in detail & quality. They allow the user to to capture images and video files of remote visual inspections for future reference. Ideal for turbine and generator inspections or automotive engine inspections. The PWC34910-109 inspection kit features the widely popular videoscope (video borescope) system consisting of a 4mm diameter, 1500mm working length, 2 or 4 way articulation (L/R), durable tungsten sheathing, built in picture taking, video recording, removable SD card, lithium ion battery pack, and now with a 4.3” LCD viewing screen all built into a compact and easy to carry handle. This system has underwent many improvements over the years to allow for better light output, better image quality, and upgraded recording software to better serve the inspection professionals utilizing the equipment. This borescope kit has been found especially useful for the inspection of PT6 engines, highlighting the units small diameter, short distal ends in order to easily navigate through the PWC34910-200, PWC34910-400, PWC34910,600 guide tubes. The kit also includes one PT6 guide tube of your choice, a rigid sleeve set along with gripping handle, heavy duty carrying case, SD card reader and battery charger. This portable videoscope is perfect for helicopter maintenance borescope for use as a Helicopter borescope as it can be used as a Helicopter Engine Borescope or helicopter airframe borescope. The same is true for Aviation borescope professionals; the portable borescope can be used as an aircraft engine borescope or simply as an aviation borescope for frame of landing gear inspections.